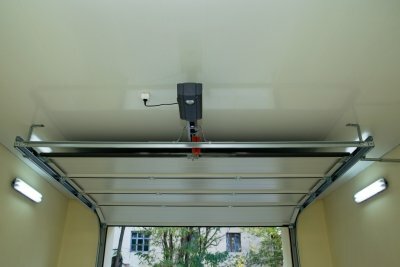 An automatic garage door opener is a real blessing, but what happens when it doesn’t work properly? You might be stuck outside, unable to get in because it won’t open, or unable to close it when you’re ready to leave. You might be scratching your head, wondering why the door keeps reversing or won’t close all the way. Whatever the problem, there may be a simple fix to get your garage door working again. Why isn’t it opening? There are many different reasons your garage door may not open when you push the button, ranging from the simple to the complex. First, let’s look at some simple, easy to fix reasons it may be stuck. The eye is blocked. 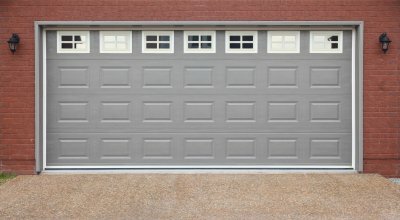 Most garage doors have a photo eye that keeps the door from working if a person or object is in the way. This eye is 4 to 6 inches off the ground and is about the size of a pea. It works by shooting a laser across the length of the garage: if the laser is interrupted, it will cut off the signal that raises and lowers the door. If nothing seems to be blocking the eye, make sure the cord attached to the eye is not cut or damaged. You might also need to clean it with a tissue, to prevent dirt or dust from clogging the eye. The unit is unplugged. 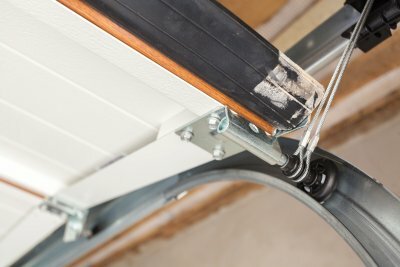 It may seem obvious, but sometimes people accidentally disconnect the garage door opener and then wonder why it’s not working. Sometimes it’s unplugged, but sometimes the outlet into which it is plugged is not functioning. Check to see if the outlet is working by plugging something else into it, or check your fuse box or circuit breaker. The unit has been turned off. Garage door motors come with a disconnect switch, so make sure you haven’t accidentally tripped it. The sensitivity is adjusted incorrectly. It doesn’t matter if your door is newly installed or older, the sensitivity can go out of adjustment. If it’s set too high or too low, the door will not open, but you can read the manufacturer’s instructions and reset the sensitivity yourself. The remote control has malfunctioned. If the remote won’t open the door, it could be a problem with the remote rather than the door. It could just be that you’re out of range, or your remote may need a new battery. If nothing seems to be working, you might need to reprogram the remote. The door is locked. When the motor is running but the door won’t open, it’s possible that you may have inadvertently locked it. 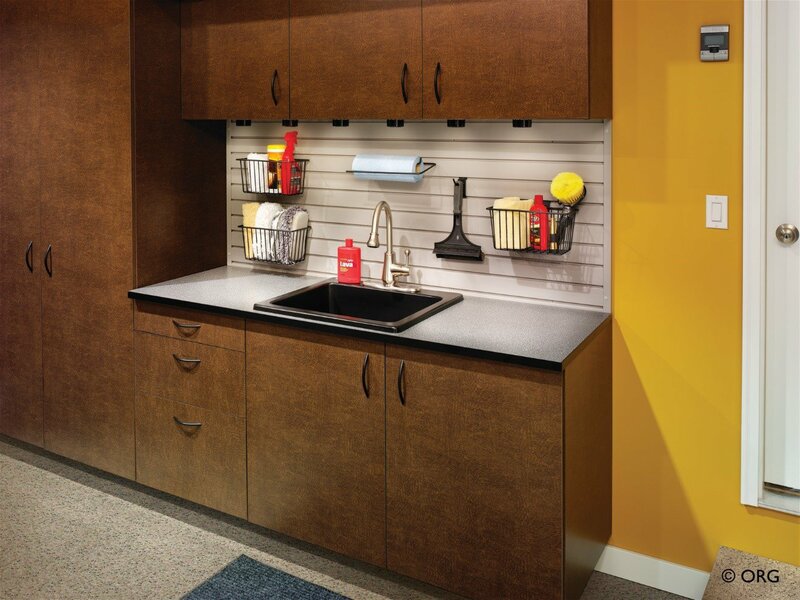 Check to see, looking for any metal parts that may have slid down to block access, then finding the locking knob or handle and disengaging the lock. The door may be off the track. If the door is not rolling smoothly on its track it may not be able to open. Check the track for bends, bumps, gaps, and obstacles, and listen for squeaking or sounds of friction. If the door slows or gets stuck as it moves along the track, it could mean that section of track is misaligned. You can fix this yourself with a rubber mallet, by loosening the screws that hold the track to the frame and tapping the track back into the proper position. Make sure to retighten the screws when you’re finished. If none of these simple fixes seem to be working, you may need the help of a professional. 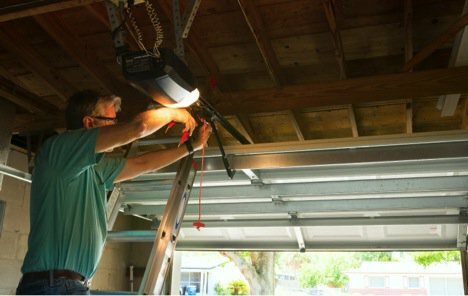 Your garage door might need a repair for a complicated reason that could be dangerous. The torsion springs may be broken. If you hear a loud noise, perhaps a sound like a gunshot or a firecracker, it could mean that a spring has broken. This is a common problem, but it’s crucial to call a professional for help. Do not try to open the door, because a broken torsion spring causes a very dangerous situation that can only be fixed by someone with the proper tools and skills. The cables may have snapped or slipped. Picture a bicycle chain becoming disengaged from the sprocket. The same thing can happen to a garage door cable. Sometimes, a torsion spring breaking can cause a cable to snap entirely, which can cause damage to a vehicle, wall, or person in the way. If something is wrong with a cable, call in a professional to help. Are you trying to solve a different problem? Here are some examples of common issues and their solutions. The door keeps reversing or pops back open as it’s closing. This could mean that there’s an obstacle in the way. Garage doors are designed to automatically reverse if they encounter an obstacle, so if there’s something in the way it will go back, even if you can’t see an anything blocking it. Check the tracks, making sure there are no rocks, pieces of trash, or other bits of debris, and wiping them down to dislodge anything that you may not be able to see. Another reason it may pop open when you’re trying to close it is that the limit setting needs adjusting. Reading the owner’s manual can help you determine how to adjust these settings and make sure they’re set properly. You can’t get the door to open all the way. This might be a sign of a broken spring, or it could mean the limit setting needs adjusting. On the other hand, you might just need to spray the track with lubricant. The door won’t open when the weather is cold. Sometimes the rollers get stiff in cold weather, and lubricating them might help. You might need to adjust the sensitivity of the opener, which can usually be done using a screw on the motor unit. To be sure how to adjust it, consult your owners’ manual. The motor keeps running when the door isn’t moving. The photosensors might be misaligned, or the cables may not be working properly. This could also indicate that the up-limit switch needs to be moved away from the motor unit, but when this unusual problem occurs, it’s usually right after the garage door opener is installed. 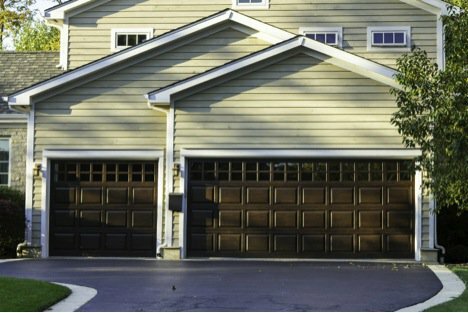 Few sounds are as annoying as the screech, whine, or thud of a garage door that’s not operating as quietly as it could be. It can be particularly grating first thing in the morning, but it’s not much of a treat at the end of a long day, either. The good news? It may be easier than you think to fix your noisy garage door. Before we begin, a caveat: Safety first. 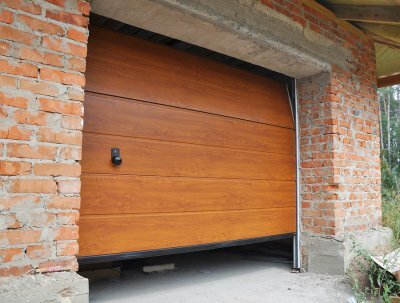 If your garage door is hard to move, opens very quickly, or seems to have derailed from the tracks, do not attempt to fix it yourself. Leave the major garage door repair to the professionals, rather than running the risk of injury or death. If it doesn’t seem like the necessary repairs are serious, though, you can proceed with making it quieter. Tighten it up. All the nuts, bolts, screws, and hinges can make the door noisy if they’re getting loose. Working with a partner, for the sake of safety, tighten everything and spray it with lubricant. Make sure not to over-tighten, though, because you can strip the screws. Out with the old, in with the new. Worn rollers and hinges can create a racket, so it may be time to replace them. If you’ve got metal rollers, consider replacing them with nylon, which are more expensive but quieter and don’t need oiling. Give it a good greasing. Well lubricated parts will make the door operate more smoothly, and that means less noise. Spray the hinges, roller bearings, and springs with a garage door lubricant, and lubricate the opener track with grease. Mind the vibration. 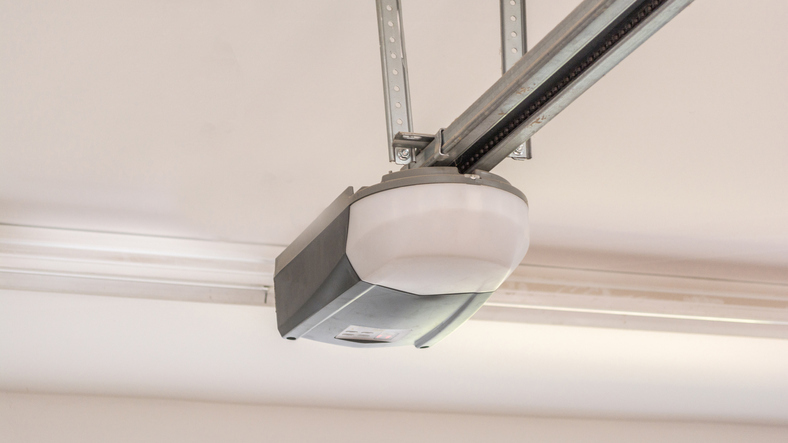 Anti-vibration pads between the mounting bracket and ceiling or noise insulators between the brace and the motor block can keep the garage door opening mechanism from shaking around and making noise. Call for reinforcements. 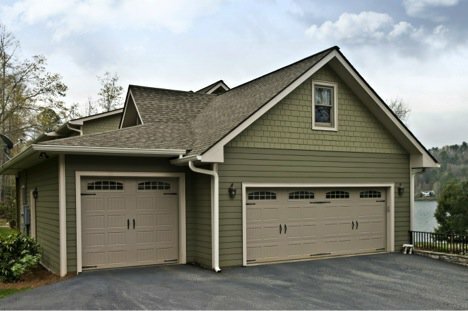 Sometimes, garage doors require more know-how than the average homeowner possesses. Don’t be afraid to call in a professional, for a safe and effective solution to your garage door problems. Whether you just need help getting rid of irritating noises or you’re ready for a new garage door, contact A1A Overhead Doors Company today. Family owned and operated, A1A Overhead Door serves the entire metro Jacksonville area. In fact, we even go up to fifty miles into the outer countries. We are licensed and insured to cover both the client’s property and ours, and we’re proud to work with our clientele and will match or beat any competitor’s written estimate. For more information, you can call 904.579.1123 or contact us through our website. Have you ever stopped to think about how heavy your garage door is? 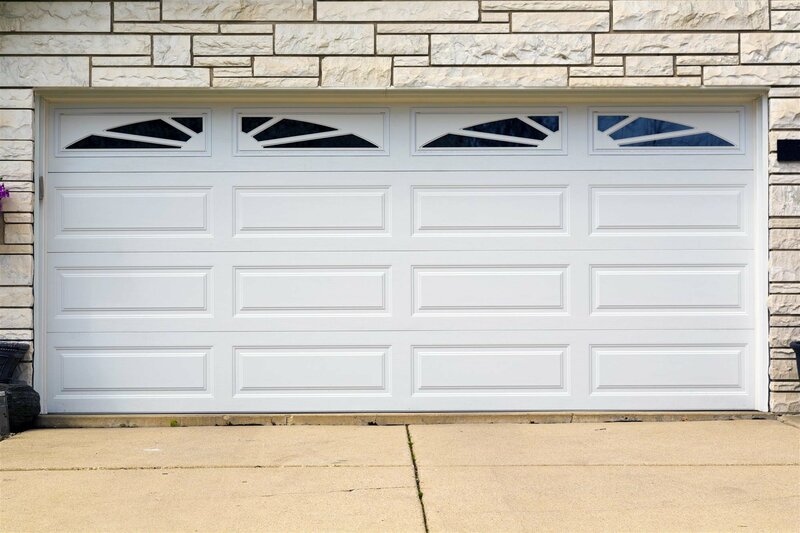 Most garage doors weigh at least a half-ton or more. 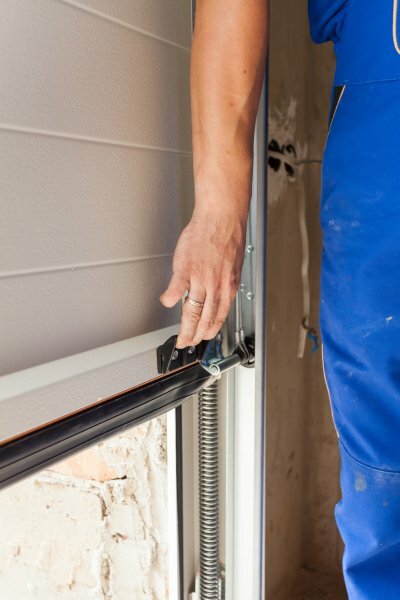 This means that the components keeping your garage door up, such as the springs, are under constant pressure whenever you have your door open. If the springs give out, it could result in the door suddenly slamming down and injuring anyone standing there. The other major hazard of a broken garage door is that it will not close all the way. If your door won’t securely shut, it means that your garage can easily be breached by thieves, who can steal your personal property or even put you in danger. Repairing a broken garage door as quickly as possible is a must if you want to keep your home safe from would-be intruders. It’s easy to assume that you can put off necessary garage door repairs, but it’s not a good idea. 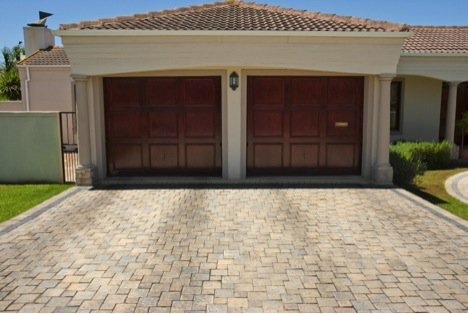 The sooner you have your garage door repaired, the less likely it is that an existing problem will evolve into a worse one. Fast repairs also help ensure that your door doesn’t cause any accidents or provide a convenient entrance for burglars. 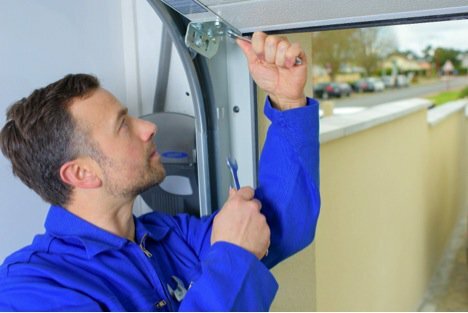 In addition to repairing your door, a repair company can also repair or replace your garage door opener when necessary.